"I'll be back." And now here he is. Almost 31 years after the release of the original, Park Circus is planning a global re-release of James Cameron's The Terminator, the sci-fi classic that started the franchise. We all know they have a brand new Terminator movie coming out this summer, Terminator: Genisys (watch the trailer), also with Arnold Schwarzenegger as The Terminator again, so it's likely all one big coordinated brand promotion across the entire world. Remind everyone of the original Terminator and bring that back to the forefront. Personally I prefer T2, but this first one is just as badass. And now I want to watch it again. Park Circus will be re-releasing the original The Terminator in theaters this summer. "Where it all began. Returning to cinemas worldwide in June 2015. He's back." 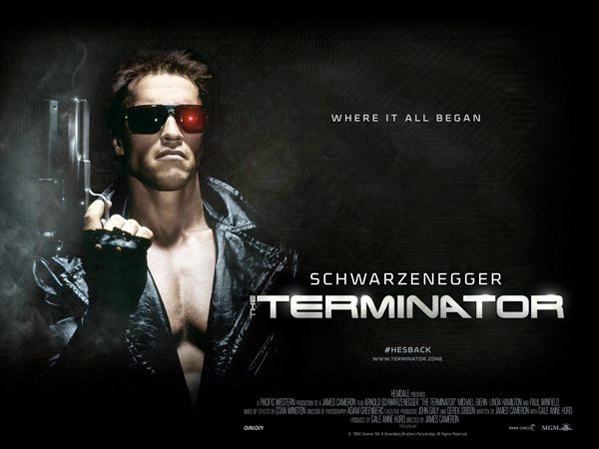 James Cameron's The Terminator was originally released in October of 1984, where it topped the American box office for two weeks. Orion Pictures was not confident in it originally and only held one press screening before opening. As for the upcoming release, details from Live for Films indicate that it will open on June 23rd in "close to 1,000 screens across more than 20 territories throughout June" in the UK. Park Circus mentions "cinemas worldwide" so it's likely it will be re-released in a few US theaters as well. For more updates from Park Circus, visit their official site. I guess the original trailer also showed everything. So that's where they got it from. Looks interesting and I shall see at the cinemas. It's about time they make some good movies for the older generation. Those over 40 years and anyone who is interested and remembers the original one from 1984. What did they do to the score? It sounds like a mix between the original and the flamboyant sound of Roger Moore era BOND films. GOD. When will they stop making these sequels that just rehash the original, and in terribly cheesy form? This franchise needs to be put out of its own misery. I remember watching it on vhs video for the first time, after a friend told me to watch it. I was totally blown away by it like watching the first time Michael Jackson's thriller music video! It made my love for movies and music much greater. But after watching the Phantom menace I realized there are allot of crappy movies out here! Still can't believe they picked Jai to be the new Kyle. I'd have preferred recasting michael beihn and de-ageing him with CGI. Or mmorph Michael bheins face on a new actor. I don't like the cast of genysis at all.